Out Heat Protection Wrap is for wrapping hot Engine parts e.g. Downpipe, exhaust Manifold or complete exhaust systems. This reduces the much to high temperatures in the Engine bay and increases the performance. This tape is made of Basalt fibers which have currently the highest ability to resist temperatures. 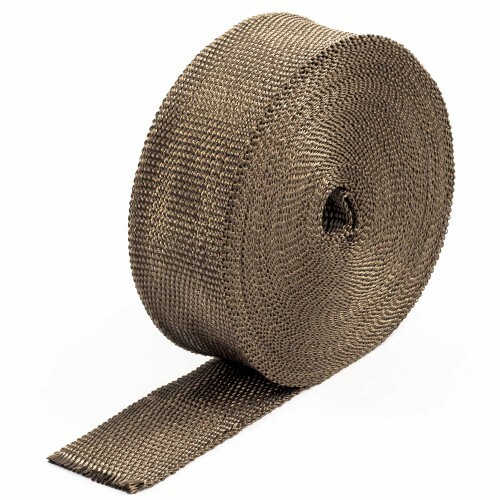 The Heat Wrap can resist continuous temperatures from 1000°C and even 1400°C for a short time. There are many variations of the 'Titan Heat protection Wrap” on the market. Cheap copies from the original made in the USA/ Germany don't accomplish the high requirements although extreme temperature data are referred to. From us you receive the Heat protection Tape for your exhaust system Made in Germany. In it's original condition it is soft and flexible and not hard and brittle. It is not needed to wrap it in a wet condition. Gloves are recommended but not mandatory! We offer Top Quality with production in Germany. Locking Ties are perfect for securing wrap to pipes with it's self-locking design. Locking Ties..